I use Seamonkey (Mac Pro, 10.11.6) as my mail client, and have for a very long time. As such, for as long as I can remember, I just stuck with the default email config from my ISP Charter and let it be, that being configured as POP. Recently, I've discovered that I'm on a very old configuration setup which has severely reduced security and I'm not getting mail from certain online folders (Spam for example). 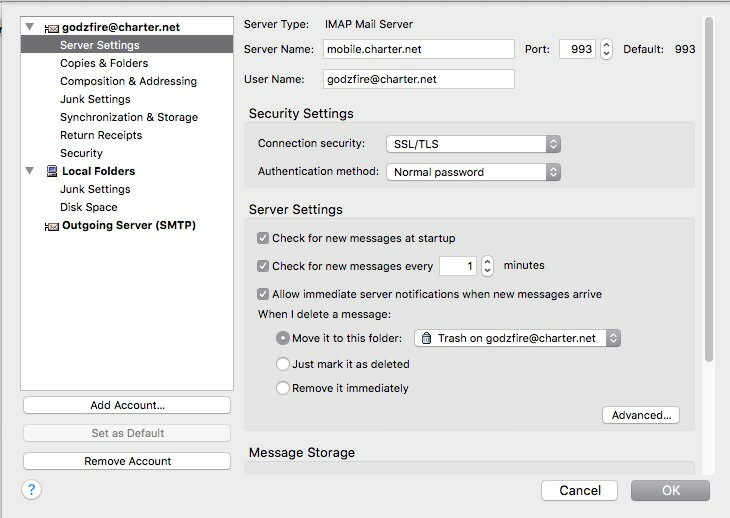 Today I attempted to set up the mail account using Charter's new recommended settings, including it being IMAP. I was able to accomplish this, but while performing some post setup send & receives, I discovered a bug with SM's mail client not checking or pulling new mail. By this, I mean if I sent a test email to myself on my old setup and A) pressed the 'Get Msgs' button or B) waited a minute or less, it would immediately play my new mail alert and the new email would be shown. This will NOT happen on the IMAP setup; I will not get the new email no matter how long I waited or how many times I pressed the button to get new emails. It only worked if I would quit and reopen Seamonkey and open Mail & Newsgroups. Please see the following pictures; the first is my old POP setup, second is the attempted new setup, and third is the new setup with Thunderbird (more on that in a second). - Tested the new IMAP setup on both a new mail account under my current SM profile, as well as a brand new test profile, same results. - Confirmed that the test emails I was sending were in fact being sent successfully and otherwise showing up immediately elsewhere, as Charter’s Webmail site, my old POP setup, and my phone (set up as IMAP) all got the tests. - Finally, on a hunch, I downloaded Thunderbird (which SM shares the same code with) and created an account using the exact same IMAP setup as I tried with SM. Sending a test email this time, came through right away and just fine to Thunderbird. Conclusion: Based on all the above, I strongly believe there is a bug with SM mail, specifically IMAP account types which is not properly checking or recognizing new mail. Please let me know what additional troubleshooting or information I can offer to get this corrected as soon as possible. Nope no problems with that. Looking for an update on this issue. Do I need to file a bug report or something in order to get this corrected? godzfire wrote: Looking for an update on this issue. AV soft usually wants to scan SSL port and this can be sometimes problematic for "not so popular" e-mail clients like SeaMonkey. I propose to make some more test with different settings in both SM (above) and AV soft (disable SSL scan or make exception for "seamonkey.exe" to avoid any scan by AV; just for test only because it's dangerous). 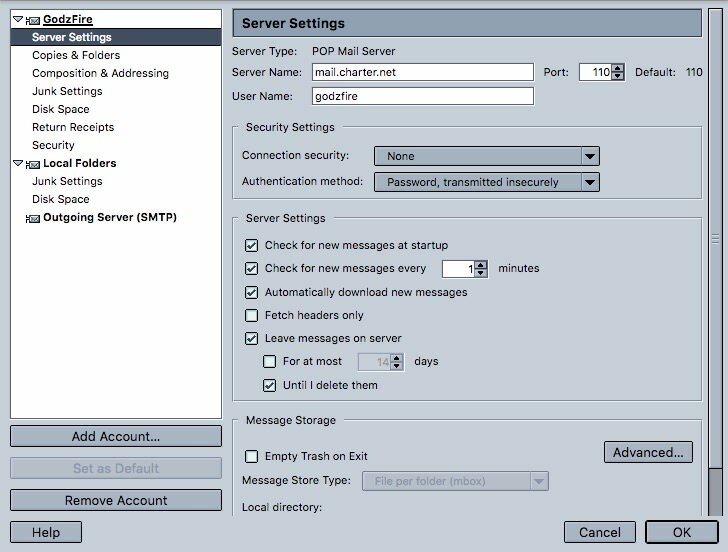 BTW For IMAP services SMTP port with SSL for outgoing messages is 465 (not 587 like described on your ISP site). > Do I need to file a bug report or something in order to get this corrected? Wouldn't help. 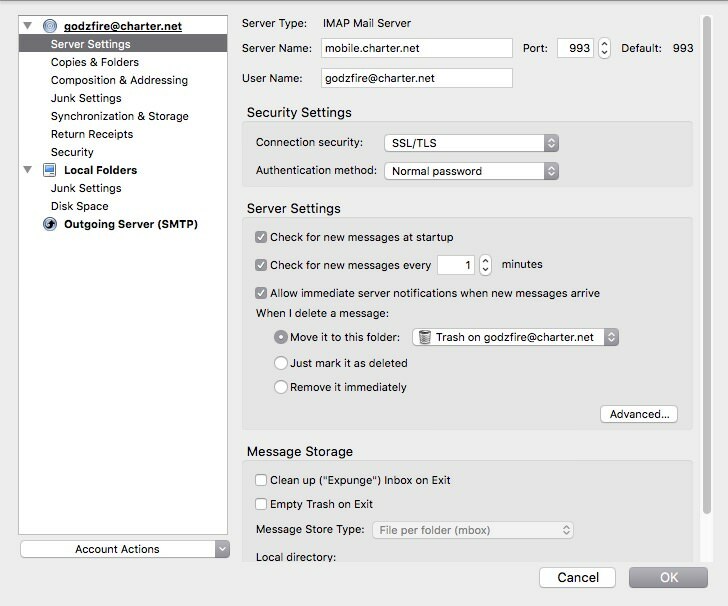 IMAP generally works in 2.49.1 and 2.49.2. Even tested it on osx High Sierra. SeaMonkey uses the same backend as Tb. The account setup is different but should not cause this. So it is probably system specific. Are you using a 3rd party firewall or AV software? I'm sorry, I didn't see this was responded to otherwise I would have commented sooner. @TPR75: I'm using a Mac, as stated in my original post. I don't have any AV. 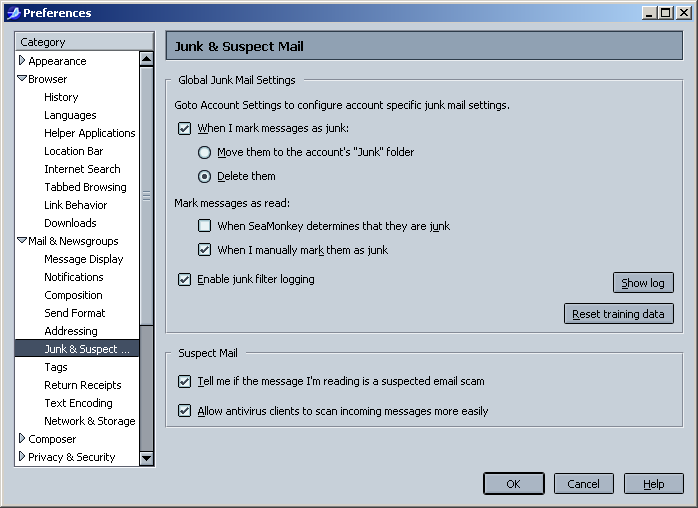 Actually everything in Junk & Suspect Mail is already disabled. @frg: Only OSX's built in firewall, which again, works just fine on a fresh configuration in TB, but not a fresh install of SM.